MGMT’s fourth album officially has a street date: Little Dark Age drops Feb. 9 via Columbia Records, with preorders opening this Friday, Jan. 19. Andrew VanWyngarden and Ben Goldwasser have also unveiled a new tour and shared a behind-the-scenes video documenting the album’s making at Tarbox Road Studios in Cassadaga, N.Y. The band’s extensive North American headlining tour, sandwiched between various European dates, is set to kick off in March with a St. Paul, Minn. show. MGMT will play Chicago’s Riviera Theatre, New York City’s Kings Theatre and Brooklyn Steel, and Hollywood’s Palladium, among other venues, wrapping up their run in Tempe, Ariz. on May 20 before returning to Europe for more shows. Tickets for all dates go on sale this Friday, as well. Previous singles from MGMT’s forthcoming album include the title track, “When You Die” and “Hand It Over”—you can find the full tracklist below. 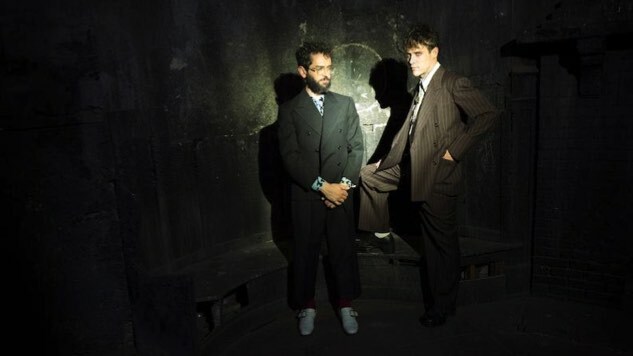 Little Dark Age follows MGMT’s Grammy-nominated 2007 debut, Oracular Spectacular, as well as acclaimed 2010 followup Congratulations and the band’s 2013 self-titled album, which was their least well-received. The band previewed their new album in a December interview, with VanWyngarden calling the LP “more relaxed” than MGMT. They also discussed collaborating with Connan Mockasin and Ariel Pink on the album, and how an acid trip inspired “James.” “I spent hours screaming at the top of my lungs about Pakistan,” VanWyngarden recalled. Patrick Wimberly (Chairlift, Kelela, Blood Orange) and Dave Fridmann (Flaming Lips, Spoon, Tame Impala) also served as producers on Little Dark Age. David MacNutt directed the album’s mini making-of movie. Watch the BTS video via MGMT’s website and listen to their 2011 Daytrotter Session below. Further down, find the Little Dark Age tracklist and the band’s tour dates.